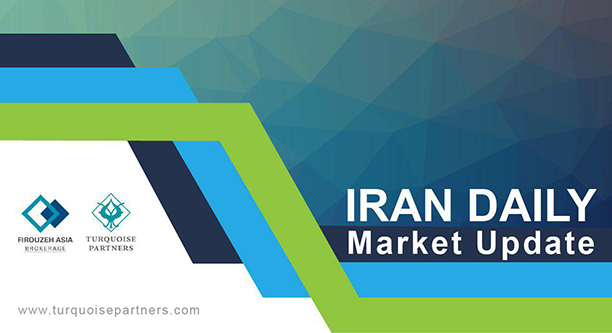 The Tehran Stock Exchange All-Share Index finished the day down 0.29% at 182,918. 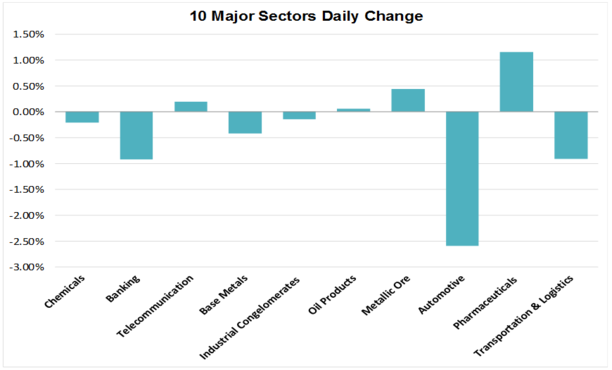 Agriculture (+2.96%) saw the highest increase among sectors, while the biggest faller of the day was Rubber & Plastics (-3.01%). Banking (-0.92%) was the market volume leader with trades totaling IRR 1,135 billion (approx. USD 27 million). Golgohar Mining & Industrial Co. (GOLC +1.23%) Persian Gulf Petrochemical Ind. Co. (PKLJ +0.62%) and Omid Investment Management Co. (OIMC +1.26%) were the main movers of the All-Share Index. Mellat Bank (BMLT -0.15%) was the most traded stock with IRR 203 billion (approx. USD 13 million) of shares exchanged. 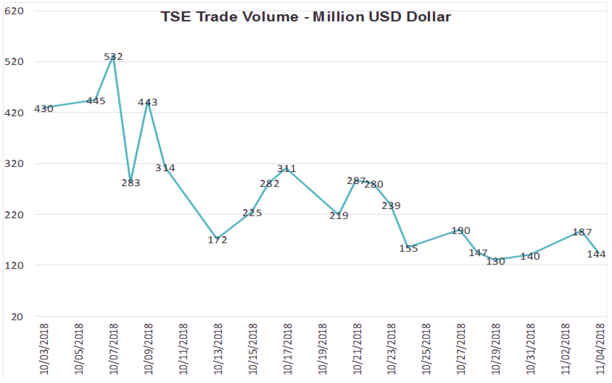 The total traded value of the market reached IRR 6.057 billion (approx. USD 144 million), down 23% from the previous trading session. The TSE30 index of the 30 largest companies by market capitalization closed at 9,116 for a loss of 0.16%. The biggest riser was Fanavaran Petrochemical Co. (PFAN +1.66%) while Iran Khodro Co. (IKCO -2.45%) dropped the most. Total traded value of the top 30 stocks reached IRR 2,132 billion (approx. USD 50 million). Dr. Abidi Pharm. Laboratories Co.
Iranian Parenteral & Pharmaceutical Co.